It’s not a new concept – ever since the dawn of men and caves, there has been junk that needs to be tossed out. Whether it’s saber-tooth tiger décor or unwanted garage sale items, spring-cleaning projects are the perfect excuse to say out with the old and in with the new! And with the added element of home dumpster rental, homeowners could take this project to the next level. One popular idea is splitting the rental between neighbors and coordinating cleanup for multiple households. Rental containers are large and can haul away a significant amount of materials. Interior reconstruction projects often warrant a home dumpster rental. It’s the safest and most efficient way to clear out the waste and debris from your renovation so that your project stays on schedule. As many contractors will tell you, getting the waste removal figured out ahead of time is essential. Came in Like a Wrecking Ball! Dumpster rental can also provide a solution for the bigger construction projects that create an intense mess on your property. 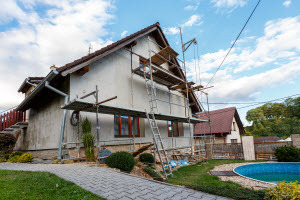 Generally, if you have a contractor spearheading your renovation, you can rely on them to secure a dumpster for rental, but it doesn’t hurt to ask questions about cost and convenience. Where will the dumpster be placed and for how long? Getting the logistical information will put your mind at ease about staying on schedule for your home improvement project. After a big storm, yard cleanup is an important part of getting back to normal safety standards. Downed trees and felled branches can damage property and pose a threat to safety that needs to be dealt with, ideally all at once. A home dumpster rental is a perfect solution when the mess is big and the time window is small. Yard work in general is also a great reason to invest in the dumpster rental service. Do you plan on hosting a big event on your property? Lots of people mean lots of cleanup! What better way to take care of the mess than with a dumpster you can roll away after the party? This solution is convenient and mindful, minimizing stress for you and ensuring that disposal happens swiftly. Your guests will also appreciate this easy and all-in-one waste management system. Working on home improvement is enough of a headache, even before you address the question of cleanup – so get a game plan as early as possible with home dumpster rental services. These services are there to reduce your stress and provide simple solutions to the waste management obstacles you encounter along the way. Click here to find out if you are in our home dumpster rental service area. After several years working for a waste management company, I started Dumpster Rental Solutions because I recognized the need for a local, reliable, one stop source for dumpster rentals that could offer low rates and excellent service. We offer temp Roll Off and Commercial Dumpster Management services. Our prices are below most offers in the industry. We are fast, reliable, and competitively priced. Can I Use a Roll Off Dumpster Service for a Small Residential Project?